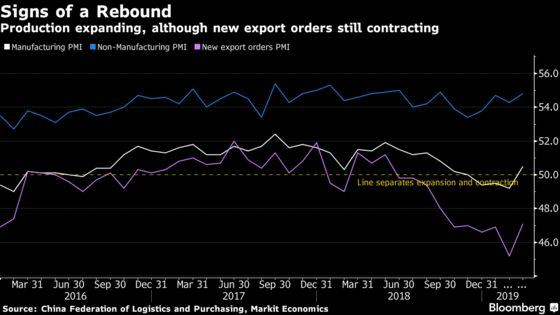 The first official gauge of China’s manufacturing sector rebounded in March, signaling a stabilization in the economy as policy stimulus takes hold. The manufacturing purchasing managers index rose to 50.5 from 49.2 last month, the biggest jump on month since 2012. The non-manufacturing PMI -- a gauge of services and construction -- stood at 54.8 versus 54.3 in February. Readings above 50 signal expansion. Leading sub-gauges improved, with new orders and new export orders both jumping to the highest levels in six months. “Monetary policy measures have been effective, and the proactive fiscal policies have stabilized investment,” said Zhou Hao, an economist with Commerzbank AG in Singapore. “In the short term, the expectation for a RRR cut will likely be reduced,” he said, referring to a reduction in the amount of money banks must keep in reserve. Zhou cautioned that the rise in the March data may overstate the actual increase in activity, as the Lunar New Year holiday in February weighed down the February data. The release backs up the signs of recovery seen in the earliest data on the economy, which showed business confidence and stock markets improving amid policy support and progress in the China-U.S. trade talks. Premier Li Keqiang told business people last week that March economic indicators would show “signs of visible improvement,” with the economy doing better in the first quarter than the government expected.